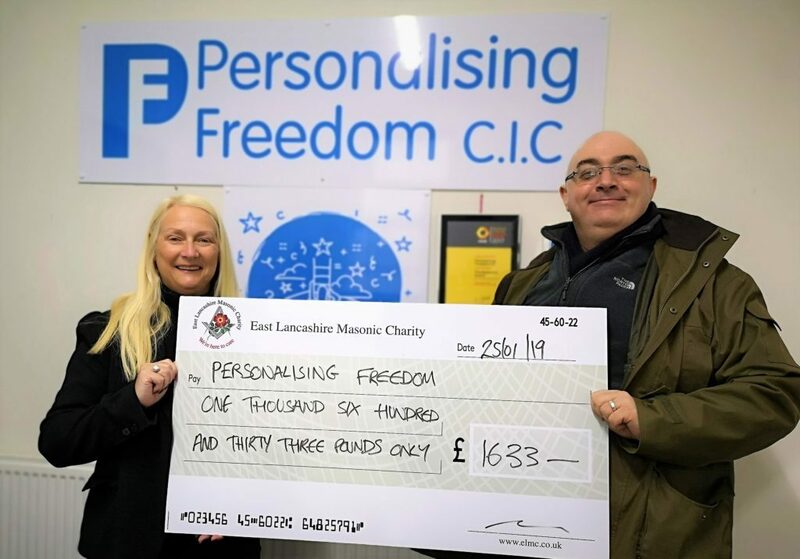 Personalising Freedom are a unique Community Interest Company and specialist service who support those in receipt of direct payments and on personal budgets. They work with individuals, families and carers to achieve personalised care outcomes by providing confidential services which includes; helping those who may be illiterate to look for support and be helped in their online applications, assisting people applying for blue badges, council or tax benefits and helping people setting up a bank account to allow direct payments. To achieve this they needed new up to date computers to support families and carers to have increased knowledge of what’s available in their local community, develop and store care plans and confidential information securely and increase people’s choice and control in their provision of care. An ELMC grant was applied for and duly approved to assist with the funding for these new computers. WBro Mike Stubbs took great pleasure in presenting the cheque for £1633 to Director Liz Crook. Image and Article: East Ribble District Team.